palarii de plaja, magneti de frigider. special comunicat in oferta locatiei in intervalul orar in care Echipa Aperol se afla in locatie. 1. Punerea in paharul Aperol a ingredientelor din care se face long drink-ul Aperol Spritz. JWT Milan releases their first work for Aperol Spritz. 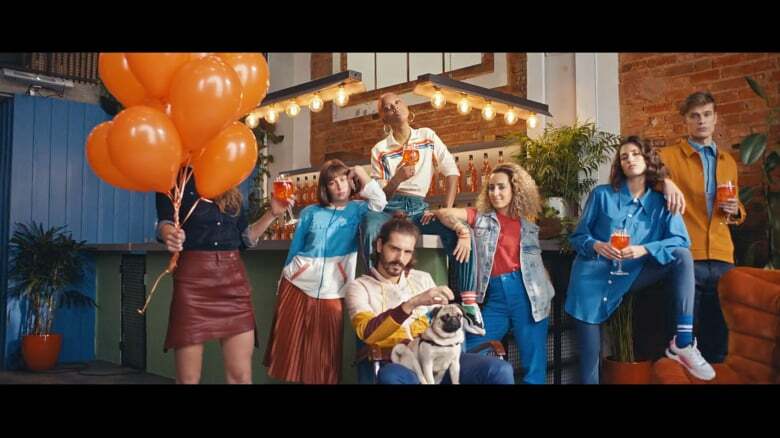 JWT Creative Director, Francesco Epifani, states that the goal of this campaign is as follows, "We wanted to give the Brand a new way of expressing itself, and a new way of talking to people. A language that everyone can speak, touching the right strings, exactly as Aperol manages to intercept everyone's tastes. What we were looking for, in a nutshell, was a Universal Language." JWT decided that French directors Grégory Ohrel and Lionel Hirlé (more popularly known as Greg&Lio) would be the perfect choice to bring their creative vision to life. When Epifani was asked why Greg&Lio were chosen, he notes, "The reason is the legacy of the duo, which comes from the world of music videos, which can be considered as the real expression of several languages, because they are able to mix music with images, dance and colors. So, we chose the music video as means of expression, which lends itself well to telling a positioning that is based on spontaneousness, cheerfulness: a true universal language, that everyone can speak." Music is also a very important part of this project. The team chose Myles Parrish's song, "Cut A Rug" as they wanted to select something that would go smoothly with the video and with the director's vision, which would be both engaging and exciting, even cheerful, without being superficial. All of the thoughtful and creative ideas comes together in a way that works and really makes this campaign special.